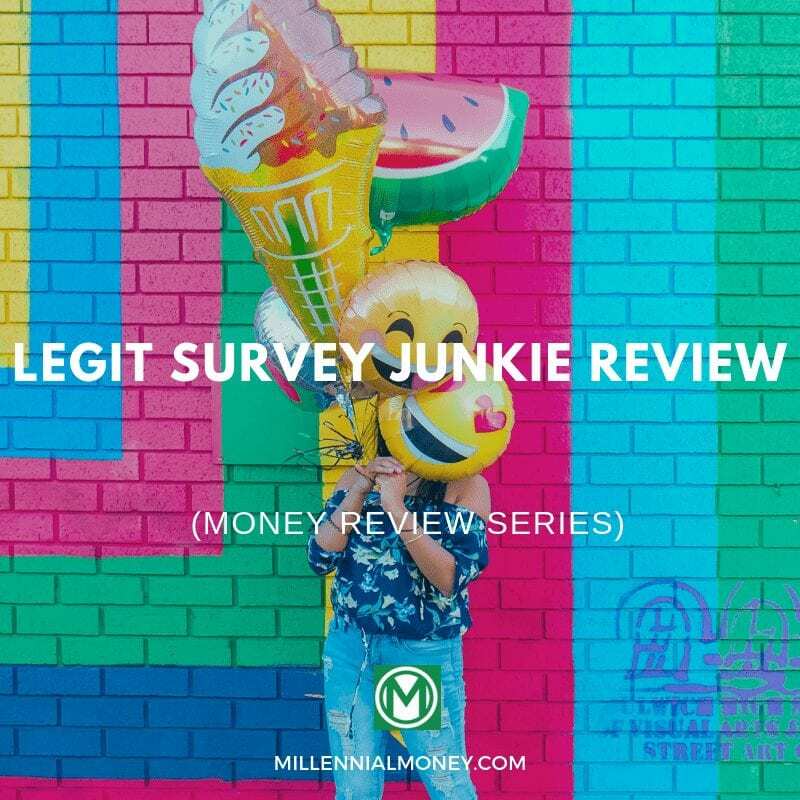 Welcome to Millennial Money’s “Money Review Series“. Each week, we review a product or service aimed to help you make more, save more, or grow money through investing. Our goal is to provide you with an honest review to help you achieve these goals. 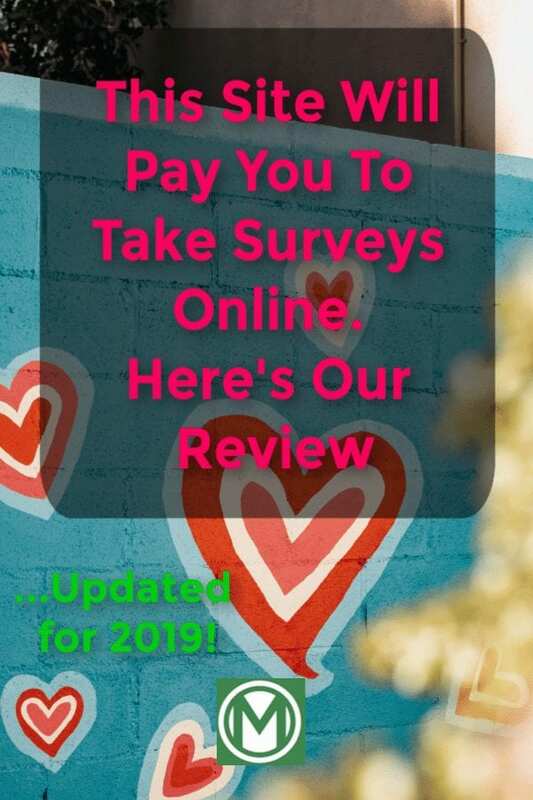 Today, we review Survey Junkie, which is a platform to make extra cash for taking surveys online. This is the most legit Survey Junkie Review you will find on the internet. -What kind of money can you make with taking surveys online with Survey Junkie? -What is Survey Junkie’s return on investment (Is it worth your time)? Full disclosure, Survey Junkie is not going to make you rich, but you can easily make extra cash in your spare time to help with bills, nights out, or even for your retirement fund. Survey Junkie is not a scam. It is a legitimate way to make extra cash in 2019. Survey Junkie is Free to sign up and use. Like any other survey website, you make money on Survey Junkie by (you guessed it) taking surveys. You can take the surveys in your account or they can email the surveys to you. Once you’ve taken enough surveys and have reached the $10 minimum, you can redeem the survey points for cash or gift cards. Some of the gift cards they offer are from big names like Starbucks and Amazon. If you’d rather just cash out, they’ll send the money right to your PayPal account. After you’ve set up your account (instructions for that below), you can start taking surveys right away. Before you click on a survey, you’ll see how many points it’s worth and how many minutes it will take. They’re usually between 10 and 200 points, and they can take you anywhere from a few minutes to 20+ minutes. These are nice features so you have a clear idea of the commitment and the reward. On top of taking surveys, you can install the Survey Junkie Pulse browser extension to earn even more points. If you’re okay with Survey Junkie monitoring your web activity (yikes! ), this can be a passive way to earn extra cash. After you’ve finished a survey, the points will show up in your Lifetime Points column on the left side of your computer screen (a lot of survey sites don’t make the points reflect on your account right away). Once you hit 1,000 points, you’ve reached the threshold for cashing out – $10. You can then choose to transfer it to your PayPal account or redeem it for a gift card. What important note: your points will expire if you stop using your account. To keep your account active and make sure you keep your points, you just have to take a survey at least once every 12 months. Many other survey sites expire your points a lot sooner than 12 months (and that’s mostly just annoying). Also, you can earn points for surveys you take that you don’t qualify for. Some survey sites will take you through a survey only for you to learn that you don’t qualify for it. That means you don’t earn any points – you’ve just wasted precious time. 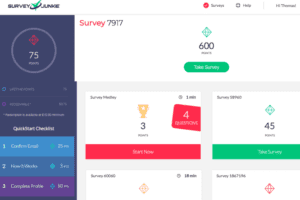 With Survey Junkie, you can earn points even if you take a survey you don’t qualify for. 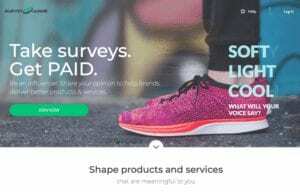 Can You Actually Make Money With Survey Junkie? In other words, is it worth your time? Well, let’s just say this is not a career option. However, it can be a good replacement for wasting time on Instagram or getting in Twitter fights. Instead of scrolling, why not make some dollar bills? Heck, you could take surveys while you’re watching Netflix – make money while you veg out. But let’s look at the reward-time commitment ratio and see if you think it’s worth your time. As I mentioned earlier, each survey will give you 10-200 points with the time spent on each ranging from three minutes to 23 minutes or more. So let’s take a real example to figure out the hourly rate. If you take a 10-point survey that’s estimated to take 6 minutes, and if 10 points equal $0.10, then you’d be making $1 per hour. This is assuming the survey takes you 6 minutes – in many cases, you can go much quicker than the estimated time. But the point here is clear: those aren’t impressive numbers. On the other hand, when compared to other survey sites, that’s actually very good. And the overall money you make with Survey Junkie depends on several things: how many surveys they invite you to take, the number of surveys you actually take, and how long each survey takes you. When you first join, there may be a slew of surveys to take. But typically, people qualify for roughly 1-4 surveys each week. Think of this way: you could probably make enough money to pay your Netflix bill each month. I used to think that taking surveys online for extra cash was a waste of time. But I’ve come around to this concept as a side hustle because it is easy to use. It is also less intrusive than other survey site platforms. With Survey Junkie, you aren’t just answering general questions about politics or your weight. The questions are focused, and allow you to express your opinion which, in turn, help brands deliver better products and services. You become an influencer! As with any survey site (or any company), people will find reasons to complain. Here are a few common complaints as well as some logical explanations. Privacy Issues: Some people are worried about privacy issues. And even though Survey Junkie doesn’t share your information, they do link to other survey sites that will share your info if you sign up with those other sites. If you connect with those other survey sites, you could find yourself getting junk emails and phone calls. To avoid this problem, you can just use a separate email address for Survey Junkie. Not Enough Money In It: Some people may be part of a more desirable demographic for certain surveys. So even if you want to spend hours taking surveys, Survey Junkie may not have that many surveys for you. No matter what survey site you use, if you compare it to your day job income, it won’t look so good. But when you compare it to other survey sites, it’s pretty good. Account Closures: Some people have reported that their account was suddenly closed without explanation. And yet they continued to get emails from Survey Junkie. Most likely, the person either didn’t use the site for 12 months or more, or they violated the terms and conditions somehow. Now let’s break this thing down list-style. What’s the good and the not-so-good of Survey Junkie? So now that we’ve covered the nitty-gritty, are you ready to get started with Survey Junkie? To start, just visit Survey Junkie’s website enter your info. You’ll be sharing your basic info, like email address, name, address, zip code, gender, and date of birth. 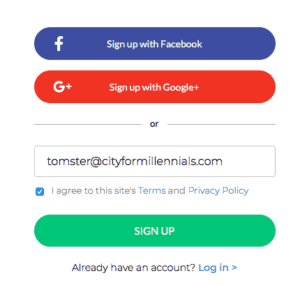 And one convenient thing is that you don’t have to verify your email before getting into your account (although eventually, you will have to verify it). The first thing you’ll see after signing up is your dashboard. On the left side, as I mentioned earlier, you’ll see your Lifetime points, your Redeemable points and how much cash they’re worth, and your QuickStart Checklist. Each step on this checklist earns you points, and it includes Confirm Email (25 points), How It Works (5 points), and Complete Profile (50 points). You can then go to the Survey tab and start answering questions and earning money. You can choose which type of “research activity” you want, which include things like online focus groups, product testing, and phone surveys. Then to complete your profile, you’ll have to answer a series of questions about your lifestyle, like if you have a pet and what type of job you have. This will take around a minute to complete. As you can tell from the image below, you earn a specified number of points for each survey completed. Really, a point is equal to a single cent. You will get paid out in $10 minimum increments. So keep up those surveys! Another important feature is the estimated amount of time each survey will take to complete. This estimate is typically an overestimate. You can speed through the questions pretty rapidly as long as you are telling the truth. So is Survey Junkie worth it? Is it a good way to make extra cash? Although the dollar signs aren’t that big, this is extra cash we’re talking about here. Money that isn’t in your bank account that could be. And you can spend just a few minutes a day in order to make several dollars a month. Think of what you could buy with a few extra bucks each month. An extra coffee. A beer for you and your friend. Part of your phone bill. So my final thoughts on Survey Junkie: try it out. You won’t know how it works for you until you give a test drive. Legit Ibotta Referral Code XFXQJCY Gives You a $10 Sign-Up Bonus!